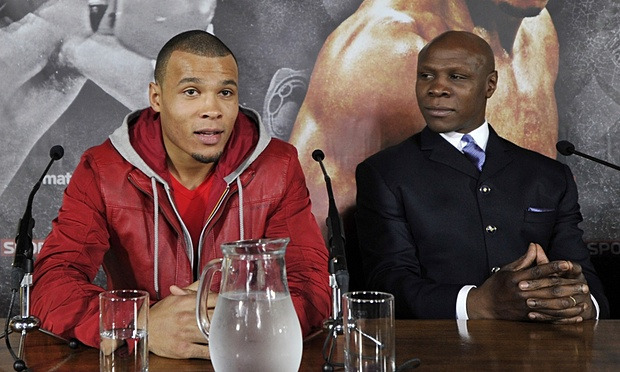 Chris Eubank Jr is to fight Tony Jeter of the USA at the Sheffield Arena on 24 October. The promising middleweight appears on the undercard of Kell Brook’s IBF welterweight title defence against Argentina’s Diego Chaves, and will be fighting for the first time since joining the Matchroom promoter. Victory would likely lead to a fight against Ireland’s Spike O’Sullivan on 12 December, when Anthony Joshua faces Dillian Whyte. Jeter insists he will put up a serious challenge. “I’m from the east coast: those guys are really crazy,” he said. “It is tough being a fighter here. Other guys in the gyms want to take your head off to stop you from getting their fights. So Chris cannot do anything that I haven’t seen before – in or out of the ring. Eubank against Jeter will come almost a year to the day since the Engishman lost his undefeated record on a split decision to Billy Joe Saunders. He has fought just once since, stopping Russia’s Dmitry Chudinov to win the interim WBA title. Jeter’s unremarkable record stands at 20 wins, four losses and a draw. Three of the 39-year-old’s defeats have come via knockout, by Peter Nielsen, José Félix and James Shedrick. Chris Eubank Jr will begin life on Sky Sports by taking on Tony Jeter in Sheffield on October 24. The 26-year-old middleweight (19-1-KO14) takes on the American on the undercard of Kell Brook's IBF world welterweight title defence against Diego Chaves at the Motorpoint Arena. Eubank Jr looks set to face dangerous Irishman Gary O'Sullivan on the mammoth O2 card on December 12 but Jeter (20-4-1-KO14) is determined to derail the Brighton man's progress despite being inspired by his father, 'English'. Eubank Jr said: "He's an experienced, tough American. Every fight is a challenge but I'm very confident that I'll come out of this one victorious. "He's had more fights than me but I'm a caged lion at the moment. I've been out of the ring for eight months and I'm ready to unleash on somebody. Tony Jeter is the guy." "Chris is a quality operator - you don't get a piece of a world title without being a class act. But that just makes it an even bigger opportunity for me; I'll have a win against a huge name on my record and I'll land on the world scene in a big way. "I'm from the East Coast; those guys are really crazy. It is tough being a fighter here. Other guys in the gyms want to take your head off to stop you from getting their fights. So Chris cannot do anything that I haven't seen before - in or out of the ring. "His Dad was one of my favourite fighters - his fights with Nigel Benn were awesome and I loved everything about him, his skill, his heart, his determination and his swagger. You can see a lot of that in his son - but he's not the Dad, he's not really been tested yet and we've not seen what he has really got when the going gets tough. "I've never taken any punishment in fights and I feel fantastic - really fresh. When I lost to Patrick Nielsen in Denmark I carried a bad back injury into the fight which was a major factor in the bout. I'm coming a long way for this fight and getting here early - there's no excuses, I'm travelling too far not to win this."